The Consumer Electronics Show (CES) took over Las Vegas once again last week, and this time, quantum dots are the hottest thing happening in TV technology. At CES 2015 LG revealed a 4K quantum dot TV, the UF9400, quickly followed by Samsung‘s own line of Ultra HD TVs featuring quantum dots. Sony was one of the first tech companies off the mark, including quantum dot technology in some of its high end TVs back in 2013. 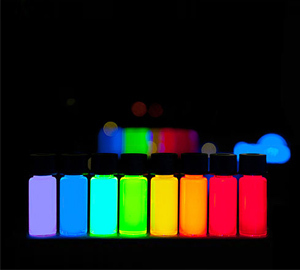 The color and brightness of quantum dots are related to their size and chemical composition. 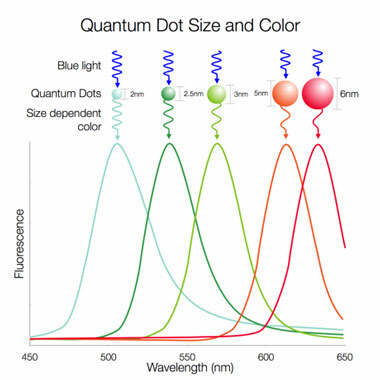 The diagram below from Nanosys, which produces quantum dots, shows how color relates to size. In our application note about measuring quantum dots using the Zetasizer Nano, we explain how Dynamic Light Scattering (DLS) can be used to provide measure the particle size of quantum dots. DLS experiments use lasers that have a single wavelength output, and this wavelength can inadvertently excite fluorescence in the particles, leading to emission of a photon at a random, later time. This fluorescence, if detected, will reduce the quality of the data. By using narrow band optical filters, the fluorescence signal can be removed and the analysis of the size of quantum dots becomes possible. The Zetasizer Nano can also measure zeta potential of quantum dots by Electrophoretic Light Scattering (ELS), which can give an insight into the stability of a dispersion or formulation that contains this type of nanoparticle. For more detailed information of the technical aspects of a zeta potential measurement, please refer to our “Introduction to Zeta Potential in 30 minutes” technical note on the Malvern website. The quantum dots application note described above shows data collected on a Zetasizer Nano instrument, and compares results of size and zeta potential measurements made with and without a narrow band filter fitted. As you will be able to see, the measurement of zeta potential is hardly influenced by the presence of fluorescence in these samples. An alternative measurement solution, Nanoparticle Tracking Analysis (NTA), can be used to determine if quantum dots in solution have become aggregated which could impact performance. In addition, it is also possible to use quantum dots in biological research. The quantum dot can be attached to a biological probe molecule such as, DNA or RNA, a protein or antibody which in turn can bind to specific nanoscale target within a biological sample. By using a NanoSight instrument in fluorescence mode, the quantum dot-labeled particles can be identified and measured for size and concentration and compared to the biological sample as a whole. By using a 405nm (violet) or 488nm (blue) laser in the instrument and a filter to only allow longer wavelengths of light to pass through (shifted towards the red end of the spectrum) the quantum dot bound particles are measured. Used in this way quantum dots are an indispensable tool in many areas of research from tracking process changes to having the potential to be a clinical diagnostic tool. This application note talks about how quantum dots can be used as an alternative to conventional fluorescent labels by those working in bio science. With quantum dot technology expected to be cheaper than OLED, it might not be long before it’s brightening the TV screens of the average Joe.